Download "A Best Practice Online Course Architect"
1 A Best Practice Online Course Architect Svein Nordbotten Department of Information Science and Media Studies University of Bergen, Norway Tor Kristian Bjelland Department of Haugesund Stord/Haugesund University College, Norway Abstract: The motivation for this work is the well known advantages of online courses that work independently of the scheduled times and locations of face-to-face courses. The project reported in this presentation began 6 years ago to support development of online courses that take advantage of the mentioned features, while at the same time compensating for the loss of face-to-face contact between students and instructor. Since 2001, 2-3 interactive online courses were offered each year to students associated with several universities and academic institutions. Student usage of each course was thoroughly logged and experience assembled in a simple, online, server-based tool for authors wanting to migrate their courses to the net. Introduction After the event of the web, online courses have been appearing and multiplying. They are in many respects a new generation of the old and well-known "correspondence courses" taking advantage of the possibilities for highspeed interaction of modern telecommunication. Compared with the traditional face-to-face lectures used for centuries, the online courses have some obvious advantages. They permit the teachers as well as the students the freedom to work when and where it is convenient as long as access to the Internet is present. Today, you can find teachers working on their courses at home in evenings after the kids are in bed, or in hotel rooms when attending conferences far from home. Likewise, students can take courses without getting into conflicts with their family or job responsibilities. Finally, universities and schools running online courses are free from the old and recurrent problems of assigning lecture halls and seminar rooms to courses. Studies of online course activities indicate that a major part of the work takes place outside ordinary work hours. A recent study referred to by ComputerWorld Norge, (Schreurs, N. 2006), shows that the percentage of female web students has grown from 40% to 60% over the last 10 years. The average age is 35 years, most students have a college, or university degree, and 75% are full time workers. There are other and less visible advantages associated with online courses. Since the sessions of an online course, the counterparts to the oral lectures of a traditional course, must be prepared and made available in a saved form, there are later no doubts about what has been said. The extensive preparation ahead of starting an online course tends to result in better documentation because the teachers themselves have a better opportunity to selfcritics. The sessions are available to students for repeated studies and can be copied and used in future work as long as they find them helpful. Another aspect frequently referred, is that students in a net-based course have in general a better opportunity to get in touch with their teachers by and other net based communication channels than students in traditional courses. On the other side there are of course drawbacks with online courses. Usually the teacher never meets her students, and the personal visual contact is lost. Some teachers and students miss this contact, which only to a small extent can be compensated by photographs of the teacher and the students. 3 Communications module. In addition, the model consists of an Instructors module which is only visible to instructors. The Information section contains sixteen components to provide general information on the respective subjects. The developer is free to select the components needed for the course. It is possible to modify the information structure at a later stage, by adding or removing components. About the course Articles Assignments Audio Calendar Curriculum FAQ Grading Images Literature Other information Software Tests Videos Virtual classroom Web links General introductory description about the course. Supplementary literature on course topics. Description of each assignment, requirements, when it is due, grading, etc. Speech, music Calendar which shows important dates, such as start date, when sessions open and close, References to text books and other study material. Frequently asked questions Details about the grading system. Links to images Literature which is useful but not compulsory. Other information Details about which software to download, how to do it, and how to configure and test it. Information about the compulsory tests included with each session. Videos, animations. Picture gallery of the students and the instructors. References to web pages Table 1. 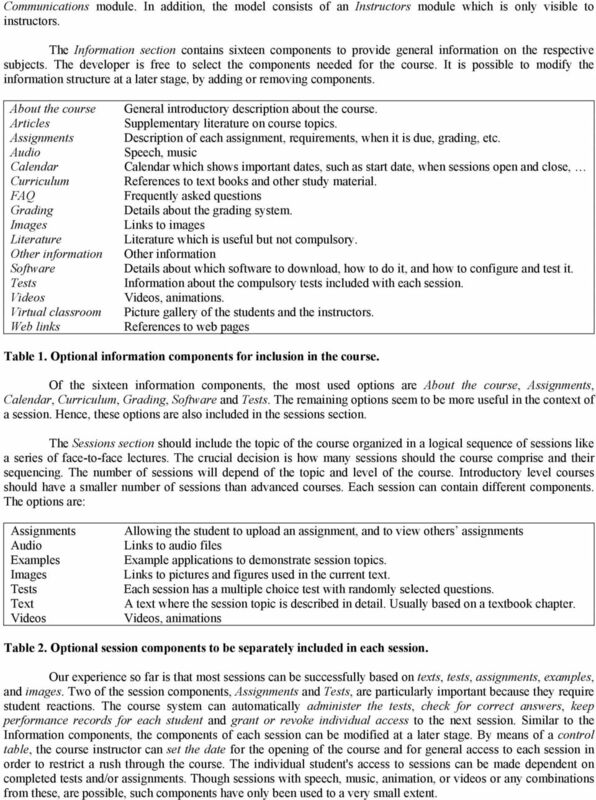 Optional information components for inclusion in the course. Of the sixteen information components, the most used options are About the course, Assignments, Calendar, Curriculum, Grading, Software and Tests. The remaining options seem to be more useful in the context of a session. Hence, these options are also included in the sessions section. The Sessions section should include the topic of the course organized in a logical sequence of sessions like a series of face-to-face lectures. The crucial decision is how many sessions should the course comprise and their sequencing. The number of sessions will depend of the topic and level of the course. Introductory level courses should have a smaller number of sessions than advanced courses. Each session can contain different components. The options are: Assignments Audio Examples Images Tests Text Videos Allowing the student to upload an assignment, and to view others assignments Links to audio files Example applications to demonstrate session topics. Links to pictures and figures used in the current text. Each session has a multiple choice test with randomly selected questions. A text where the session topic is described in detail. Usually based on a textbook chapter. Videos, animations Table 2. Optional session components to be separately included in each session. Our experience so far is that most sessions can be successfully based on texts, tests, assignments, examples, and images. Two of the session components, Assignments and Tests, are particularly important because they require student reactions. The course system can automatically administer the tests, check for correct answers, keep performance records for each student and grant or revoke individual access to the next session. Similar to the Information components, the components of each session can be modified at a later stage. By means of a control table, the course instructor can set the date for the opening of the course and for general access to each session in order to restrict a rush through the course. The individual student's access to sessions can be made dependent on completed tests and/or assignments. Though sessions with speech, music, animation, or videos or any combinations from these, are possible, such components have only been used to a very small extent. 4 To compensate for the loss of face-to-face contact, several means for communicating with the instructor are available. Chats Discussion boards Messages Progress report Questions and answers Sms The Chat option can be opened and closed for chat sessions controlled by the instructor Discussion boards allows the instructor to open one or more topics for discussion. An embedded component in case the user does not have her/his own client. A chronological message board, mainly used for announcements from the instructor. A reporting feature that permits each student to see his/her private progress status. Questions and answers enables public questions to and answers from the instructor. SMS allows bilateral communication between student and instructor via mobile phones. Table 3. 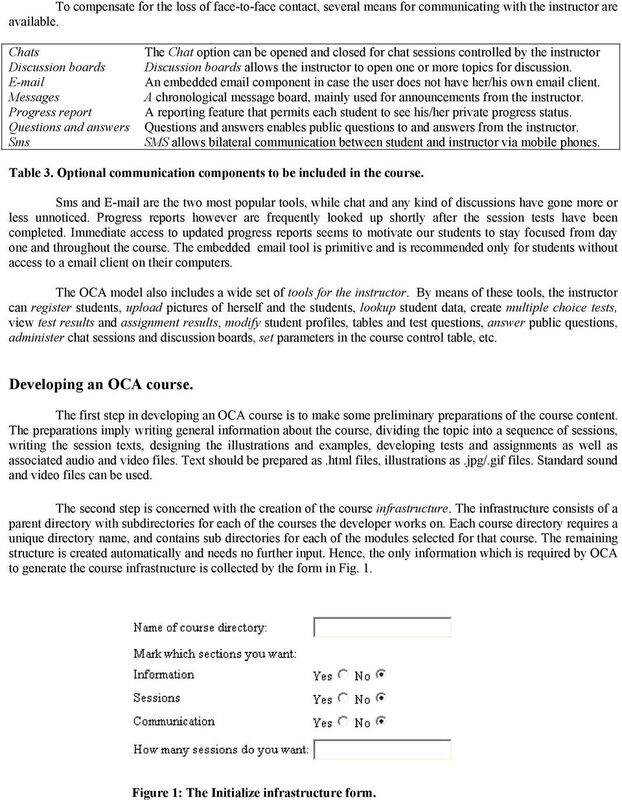 Optional communication components to be included in the course. Sms and are the two most popular tools, while chat and any kind of discussions have gone more or less unnoticed. Progress reports however are frequently looked up shortly after the session tests have been completed. Immediate access to updated progress reports seems to motivate our students to stay focused from day one and throughout the course. The embedded tool is primitive and is recommended only for students without access to a client on their computers. 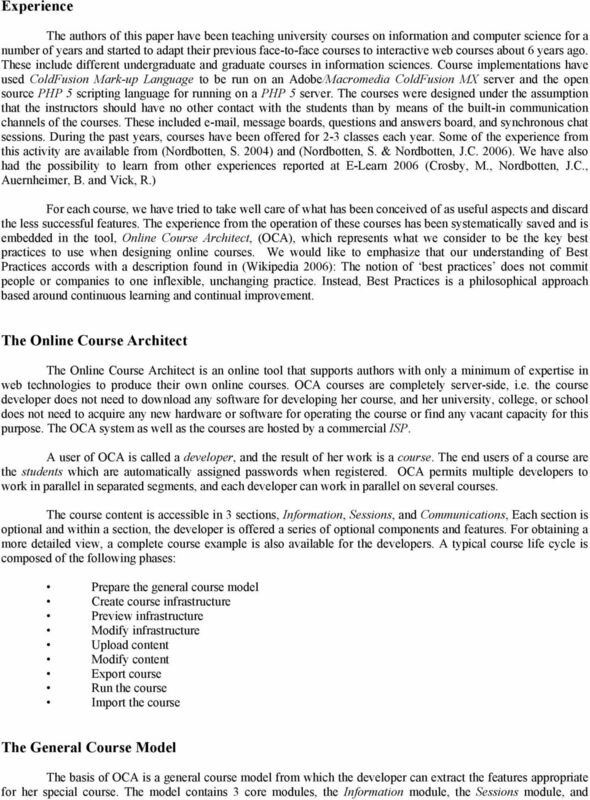 The OCA model also includes a wide set of tools for the instructor. By means of these tools, the instructor can register students, upload pictures of herself and the students, lookup student data, create multiple choice tests, view test results and assignment results, modify student profiles, tables and test questions, answer public questions, administer chat sessions and discussion boards, set parameters in the course control table, etc. Developing an OCA course. 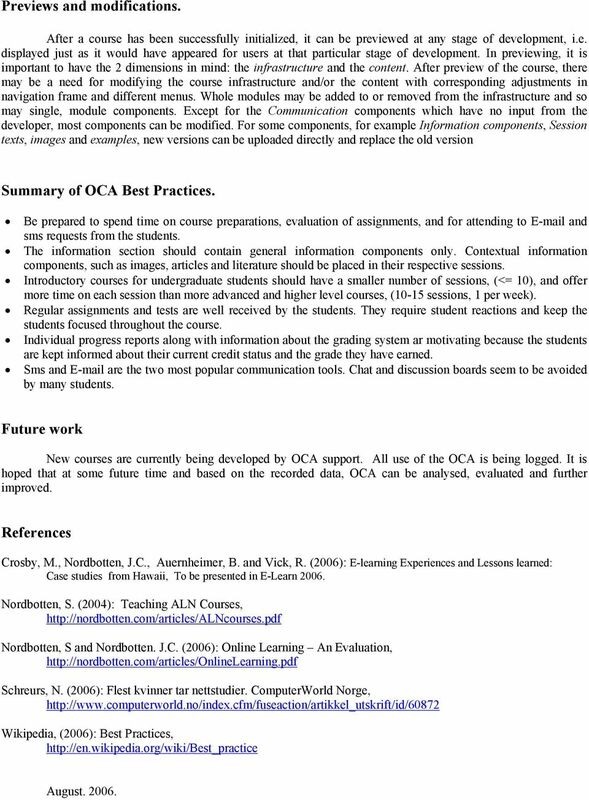 The first step in developing an OCA course is to make some preliminary preparations of the course content. The preparations imply writing general information about the course, dividing the topic into a sequence of sessions, writing the session texts, designing the illustrations and examples, developing tests and assignments as well as associated audio and video files. Text should be prepared as.html files, illustrations as.jpg/.gif files. Standard sound and video files can be used. The second step is concerned with the creation of the course infrastructure. The infrastructure consists of a parent directory with subdirectories for each of the courses the developer works on. Each course directory requires a unique directory name, and contains sub directories for each of the modules selected for that course. The remaining structure is created automatically and needs no further input. Hence, the only information which is required by OCA to generate the course infrastructure is collected by the form in Fig. 1. Figure 1: The Initialize infrastructure form. 5 In the third step, if you have decided to include the information section in the course, you will be asked to select information components. The user interface is similar to the one in Fig. 1, and the options are similar to those listed in Tab. 1. In step four, you will select components for each session. Depending on the number of sessions that you entered in the infrastructure form, the session form will be redisplayed once for each session. Figure 2: Optional session components to be selected. A session can contain any combination of these components. In most regular courses, Text will be included. In special applications, for example containing reading assignments and tests, text may be not be included. You can choose different components for each session, and the infrastructure of each session can be modified later if there should be a need. Finally, in step five, the tools for the Communications section between the instructor, course system and the students has to be set up. 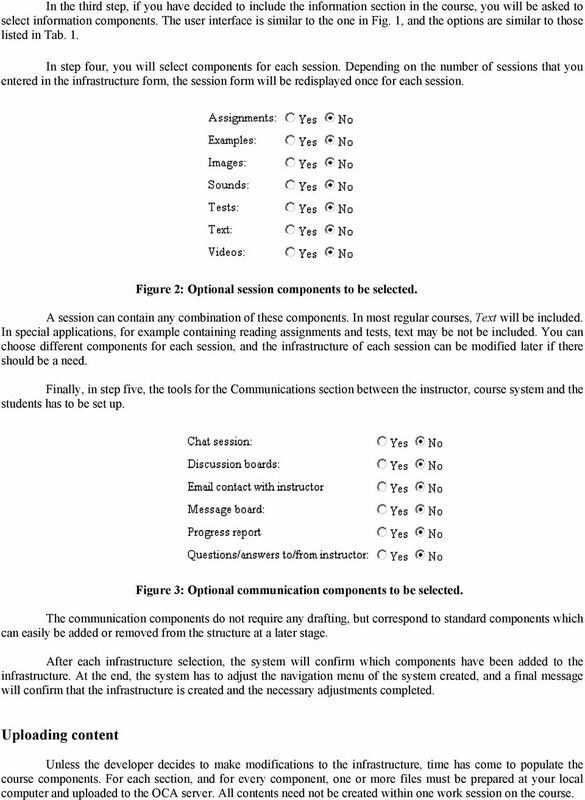 Figure 3: Optional communication components to be selected. The communication components do not require any drafting, but correspond to standard components which can easily be added or removed from the structure at a later stage. After each infrastructure selection, the system will confirm which components have been added to the infrastructure. At the end, the system has to adjust the navigation menu of the system created, and a final message will confirm that the infrastructure is created and the necessary adjustments completed. Uploading content Unless the developer decides to make modifications to the infrastructure, time has come to populate the course components. For each section, and for every component, one or more files must be prepared at your local computer and uploaded to the OCA server. All contents need not be created within one work session on the course. LMS LMS is our premium web based E-learning and management solution. It is SCORM and LDAP compliant. (Active Directory LDAP engine) LMS is a powerful web based easy to use, e-learning software system. Blackboard IM for Virtual Office Hours and Collaborative Group Work Blackboard IM is an instant collaboration solution designed to promote learning through group work and academic and administrative help. UNIVERSITY OF FLORIDA DEPARTMENT OF TOURISM, RECREATION AND SPORT MANAGEMENT HFT 3253 Lodging Management and Operations Summer 2015 (4.10. I ve logged in! Now where do I start? Adobe Connect Mobile 2.0 Getting Started For Hosts and Presenters using tablet devices Adobe Systems Incorporated. All Rights Reserved. Action Bar. Action Link. Action Links Icon. Add Content Link Button. Administration Area. Adobe Presenter. Alt Text. Changes to Cecil Explorer since Dec 2003 Release This document will outline the changes in this new release. For full details of the instructions please refer to the online manual (http://cecil.auckland.ac.nz/help/ce7). Angel Learning Management System Introductory Tutorial for Students 2008-2009 Academic Year Center for Distance and Professional Education, (800) 222-4978 distance@wsu.edu Introduction Welcome to Angel!